Beginning Monday, May 19, TriMet bus riders may notice something new when they pull up TransitTracker: Canceled buses. While TriMet staff work very hard to provide customers the service they depend on, there are situations that lead to a bus trip or part of a trip being canceled. Now, thanks to a feature in the agency’s new bus radio/dispatch system, Transit Tracker will finally be able to tell riders when a bus is not coming. Previously, when a bus was canceled, TransitTracker would simply give a “scheduled at” time (such as “2:45 p.m.”) instead of a countdown. Other times, the countdown would go all the way down to “Due” but the bus would never come. Many riders refer to this phenomenon as “ghost buses” because the buses just seem to vanish. Our new bus radio/dispatch system now gives TriMet the technology to automatically send information to TransitTracker when a bus trip is canceled, eliminating most “ghost buses”. We say ‘most’ because there may be instances when a bus is not officially canceled in the system. There may also be times a bus does show up even though TransitTracker says it’s canceled. This could be due to an extra bus sent to fill the remainder of a route. This is the first phase of improvements to the reliability of the real-time information supplied through TransitTracker, and future upgrades should make it even better. TriMet is taking steps to increase service and reliability, but there are times when an unplanned interruption will impact trips. Construction, a mechanical issue, a medical emergency, a fire, police activity, weather conditions and other issues can lead to a bus trip, or just part of a trip, being canceled. That means some or all of the stops on the bus route won’t be served. Currently the MAX system does not have the same technical abilities as our new bus system, so TransitTracker cannot provide the same depth of information for trains as it can for buses. TriMet will, however, be adding GPS to our light rail vehicles, which will allow for better, more accurate TransitTracker information about MAX train locations. That is still a few years out, however. Let us know how the canceled bus notices work for you. 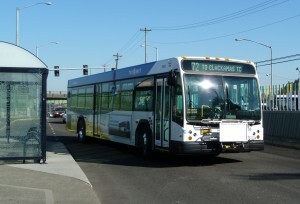 If you have any issues or any other comments about the improved TransitTracker system for buses, email TriMet’s Customer Information team at transittracker@trimet.org.